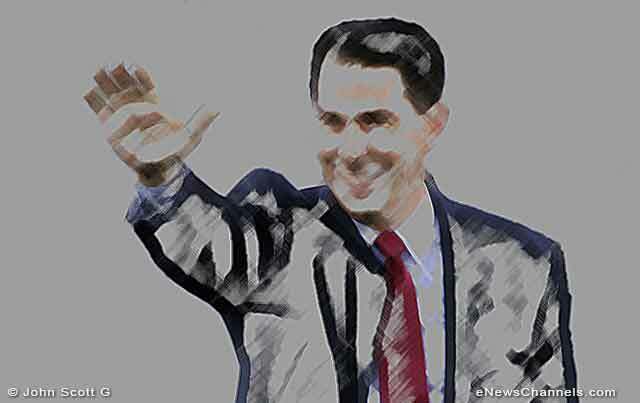 Home ARTICLES and Columns Is Scott Walker the Poisonous Seedpod Pet of the Koch Brothers? Scott Walker, rightwing nutjob governor of the state of Wisconsin, remains in office due to the prodigious amounts of money poured into his campaigns by Charles and David Koch, rightwing nutjob residents of the state of denial, I mean Kansas. The Kochs are the repellant billionaires who own several members of Congress and many sock puppets in state legislatures around the country. Their latest acquisition: the Scott Walker Seedpod Pet. Dear American Voter: Congratulations on your choice of “Scott Walker,” the newest Koch Brothers RWNJ Seedpod Pet! We know you will enjoy countless hours of fun and fascination as you watch it sit quietly instead of spewing un-American bile and nonsense like its namesake. For maximum customer satisfaction, we urge you to read your Owner’s Manual, including all of the important Safety Instructions. Every RWNJ Seedpod Pet is unique. Well, not so much unique as different. Well, not so much different as exactly the same except for its external appearance. They all sprout diseased leaves from the Koch Brothers’ patented anti-democracy seeds of doubt. Please follow all Directions for proper use of your Pet. c) Millions of dollars (must be acquired separately). Construct a room-size fort using stacks of $1,000 bills. Crumple several pounds of bills and stuff the center of the fort with a mixture of lucre, seeds, and excrement. d) Soak the mixture of money, seeds, and dung with the sweat of underpaid, uninsured working people and the tears of their children. e) The recommended amount of sunlight is getting shorter as humankind’s destruction of the ozone layer increases the effect of the Sun’s rays. g) All genuine plastic RWNJ Seedpod Pets come in the shape of a human head. There are a number of models but whether you have the Batcrap Crazy Gal (Joni Ernst), the PretendSmart Liar (Rand Paul), or the Kochsucker (Scott Walker), they all will grow a mossy substance that vaguely resembles a full head of hair. The Walker will not grow in at the crown in order to simulate the governor’s Alopecia. Step 2. After assembly, walk away. Not watching the actions of RWNJ politicians is the American method of dealing with them. Simply allow power to ebb from the general population and flow to multinational corporations, billionaires, millionaires, and others not willing to pay their fair share of taxes. * Your seedpod pet will never lie to you. * Your seedpod pet will never attempt to countermand the ideals of the University of Wisconsin by removing the words “searching for truth” from the school system’s mission statement. * Your seedpod pet will never erroneously claim that Wisconsin has a budget surplus. * Your seedpod pet will not equate peaceful protestors with ISIS as Gov. Kochsucker has done. * Your seedpod pet will not be for immigration reform and then against it and then for it and then… as Gov. Kochsucker is doing. * Your seedpod pet will not be so muddleheaded that even the douchebags at TeaReason magazine start pooh-poohing him. * Your seedpod pet will not accept $1.5 million in secret contributions from John Menard Jr., a convicted polluter, in exchange for tax credits. * Your seedpod pet will not deny science facts as Scotty Still-Learning-to-Walk is doing. * Your seedpod pet will not attempt to curtail the rights of workers, impose radical rightwing austerity economic policies, defund education, emasculate campaign finance laws, constrain voting opportunity, and eradicate women’s rights as Gov. Kochsucker is doing. In order to maintain the proper environment for your seedpod pet, it will be advisable to avoid all science, math, logic, morality, factual data, proper use of English (including spelling), or most governmental systems except plutocracy and Fascism, which RWNJs call “Conservative principles”. Warning: all RWNJ Seedpod Pets are highly toxic. Always utilize protective eyewear and gloves to avoid exposure to the poison of Conservatism. John Menard, Jr. is the billionaire owner of a chain of hardware stores. He was convicted of illegally dumping hazardous waste in his own neighborhood. The Koch Brothers’ kingdom deals in the types of petroleum products that are befouling the Earth’s air and water (the Kochs are aggressively pushing the Keystone pipeline, for example) but they have also invaded your supermarket with consumer products from their subsidiary, Georgia-Pacific. The Koch G-P output includes toilet paper (Angel Soft, Quilted Northern, Soft ‘n’ Gentle), napkins and paper towels (Brawny, Mardi Gras, Sparkle, Vanity Fair, Zee), and paper cups and plates (Dixie). Decent people refuse to purchase these products as a protest against the Koch Brothers’ attempt to debase democracy. Chia Pet® is a registered trademark of Joseph Enterprises and is not affiliated with the RWNJ Seedpod Pet products. Koch Industries is the official name of a multinational assemblage of greedwhores under the direction of Two Kansas Scumbags.